At iClub BIZ we realize that coffee lovers love their coffee, and so we felt a responsibility to provide our customers with the best possible choice for great-tasting healthy coffee. iPrime Java gives coffee lovers the best of both worlds. You will not have to compromise on taste to enjoy this organic coffee with health benefits. iPrime Java offers the “best of the best” organic Arabica beans with the health benefits of the amazing Mangosteen fruit and Reishi Mushrooms (Ganoderma). The Arabica beans are grown at the highest elevations producing some of the richest, smoothest tasting coffee in the world, with no bitter after-taste. 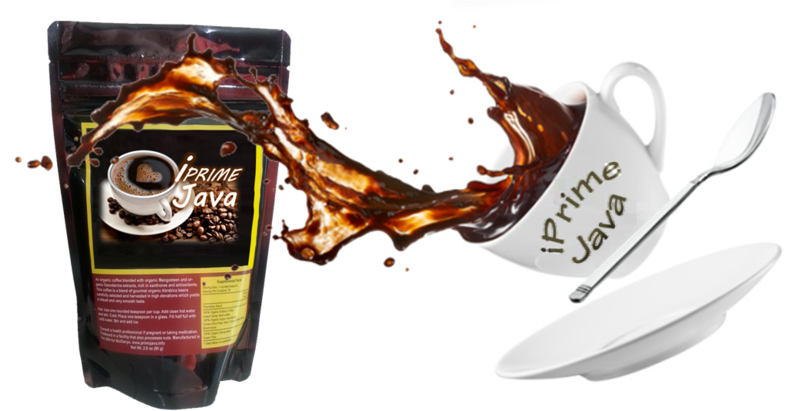 iPrime Java is an instant coffee, so you can conveniently enjoy a fresh cup anytime, hot or cold. 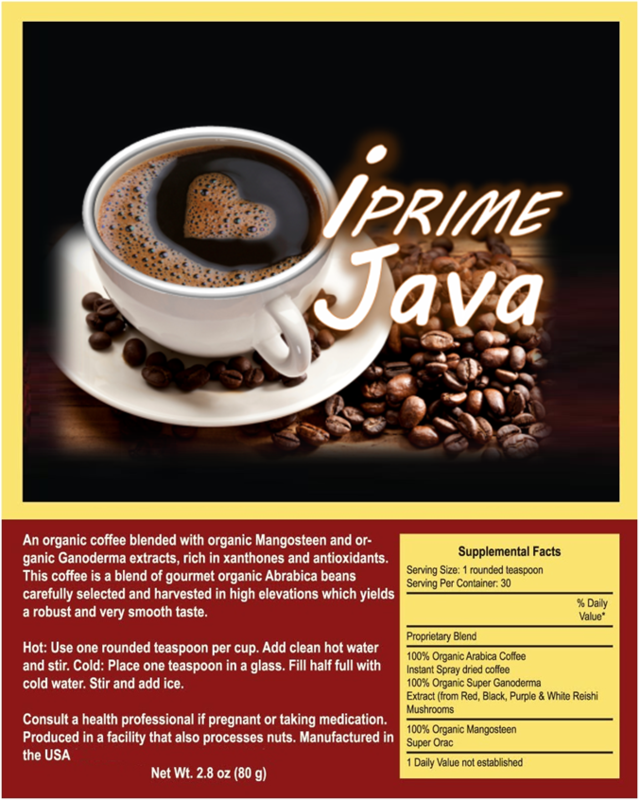 Simply put: there is no other coffee that can compare to the health benefits in every cup of iPrime Java! We have heard it said before….”prevention is far greater than a cure”. We want to encourage others, if they are going to drink coffee, choose iPrime Java…”the healthy coffee”. If we make healthier choices, even in the coffee we drink, we can help to avoid the onslaught of health issues that can manifest as a result of poor food and drink choices. Why did we add organic Mangosteen Extracts to iPrime Java? Mangosteen has been a part of the traditional medicine of various Asian countries for centuries. The health benefits of mangosteen have been realized since the 18th century and have further been proven through many independent scientific studies and clinical experiences throughout the years. The Mangosteen fruit is a storehouse of essential nutrients which are required for overall nutritional well-being. This versatile, highly effective “super-fruit” extract further enhances the organic Arabica beans that make up iPrime Java. When you first hear about Mangosteen you may be shocked by the number of health-enhancing properties this exotic fruit provides. As you take a closer look at Mangosteen, you’ll find solid scientific evidence behind this fruit’s health benefits. A Storehouse of Essential Nutrients. This exotic fruit contains some of the most potent antioxidant, anti-inflammatory, antiviral, antibacterial, and antifungal compounds found in nature. Antioxidants – Most fruits contain varying amounts of antioxidants, but Mangosteen seems to “specialize” in them. Among the antioxidants are catechins (considered by researchers to be five times more effective at scavenging free radicals than vitamin C), stilbenes (possesses excellent anti-fungal properties, even after digestion), quinones (potent anti-bacterials), and polyphenols, (stronger antioxidants than vitamin E). Xanthones – Mangosteen contains more than 40 biologically-active, natural compounds called Xanthones. While all these Xanthones have similar properties, each one has its own unique composition that performs a specific function. Alpha-mangostin, for example, is a very potent antioxidant. Gamma-mangostin is a powerful anti-inflammatory. Garcinone E is a strong anti-tumor agent. These and the other Xanthones provide a virtual “medicine chest” of natural compounds that address a wide variety of health issues. Vitamin-B Complex – Mangosteen contains respectable amounts of several B-vitamins, such as niacin, folate, riboflavin and thiamin, which helps the body to metabolize proteins, fats and carbohydrates. B-vitamins are also used in making neurotransmitters like serotonin, which provide mood-boosting benefits. This makes Mangosteen a good choice for individuals suffering from depression and lethargy. Fiber – Mangosteen contains dietary fiber which helps to make us feel fuller longer and discourages overeating. Mangosteen contains no cholesterol and is a natural energy booster making everyday tasks,even exercise, easier and more enjoyable. Why did we add organic Reishi Mushroom Extracts to iPrime Java? Organic iPrime Java qualifies as a healthy coffee with organic Mangosteen extract alone, but with the addition of organic Reishi mushrooms extracts…it’s over the top! There has been a ton of research on Reishi mushrooms over the past 30 years, proving the natural health benefits of these mushrooms. iPrime Java didn’t stop with just one type of Reishi mushroom extract, it has four different types: red, black, purple, and white. This makes it far superior to other coffees on the market that contain only one kind of Reisha, often referred to as Ganoderma. Powerful Antioxidants – Several studies have shown that Reishi is one of the most powerful mushrooms with regard to antioxidant capabilities. The research shows that these mushrooms are highly effective in boosting your body’s own immune system to fight viral infections, and help guard against high blood pressure and high cholesterol, which also helps in reducing stress and preventing fatigue. All this is wonderful, however, the most important reason to add Reishi mushroom extracts to iPrime Java is the fact that they help to normalize and regulate the body’s organs and systems. Immune-Booster – Additionally, reishi mushrooms contain beta-glucans, which have been observed in animals to stimulate certain immune cells. As recent as 2012, several studies revealed that Reishi mushrooms have more advanced mechanisms than had been previously suspected in the surveillance, detection and elimination of emerging dysfunctional cells. Their system for attacking these cells is extremely sophisticated and effective. A healthy immune system normally searches out these cells quickly, activating killer cells to destroy them before they can cause any real damage. We know dysfunctional cells evade immune system surveillance by “hiding” their abnormal surface markers. Reishi extracts force these cells to reveal their telltale markers, flagging them for destruction by immune killer cells. At the same time, Reishi extracts promote the production of specific molecules that the immune system needs to complete the killing process. Reishi Promotes Neuroprotection – Reishi’s powerful antioxidant and anti-inflammatory properties make these mushrooms attractive candidates for preventing neurodegenerative diseases such as Alzheimer’s and Parkinson’s. Both of these diseases are driven by oxidative stress and inflammation. The triterpenes and polysaccharides from the mushrooms reduce the oxidative impact of destructive proteins such as Abeta, the chief trigger of Alzheimer’s disease, and they protect brain cells from the inflammation known to cause Parkinson’s disease. Studies reveal that supplementing with Reishi mushrooms also has beneficial effects for stroke victims. First, it can limit the size of the stroke-damaged area in the brain, which helps limit behavioral and functional damage caused by the stroke. Second, Reishi mushrooms protect brain tissue from hypoxia/reperfusion injury, the “one-two” punch of oxygen starvation followed by excessive oxidation that produces most of the damage in the brains of stroke victims. The specific therapeutic agent in reishi mushrooms remains unknown. However, a number of the mushroom’s phytonutrient constituents may play a therapeutic role. The major constituents of reishi mushrooms are polysaccharides, triterpenoids, sterols, nucleosides and alkaloids. Other components include mannitol, fatty acids, peptides, proteins, ganolucidic acid and coumarin. The sterols contained in the mushroom can act as hormone precursors, while triterpenes may exhibit anti-histamine, anti-allergy effects, and may help lower blood pressure. Switch to iPrime Java today and see how changing from ordinary coffee to healthy coffee can start your day off right!